Start: Lyndhurst village centre, or the roadside lay-by opposite the Police Station. After leaving the village centre, the walk crosses an extensive area of grassland that is a magnet for commoners’ ponies and cattle. Until around 1880 it was the site of Lyndhurst’s race ground - the adjacent road is still called Racecourse View. And from 1922 until after the Second World War, it played host to the New Forest pony sales and accompanying fair. Beyond the race ground, the route skirts Lyndhurst golf course, before passing through a narrow band of alder carr, and an extensive area of heathland. Ancient, unenclosed woodland is a significant feature of the area, particularly later in the walk, and so are woodland inclosures. 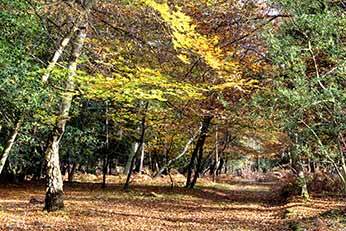 Indeed, 19th century inclosure planting has had a profound effect on this and many other parts of the New Forest. Such landscape changes have, though, in most cases had many years in which to become established, and wildlife is abundant in both the old woods and relatively new inclosures. Listen for the year-round ringing calls of nuthatches as these dapper creatures clamber up trunks and boughs. Great spotted and green woodpeckers are also prominently present, whilst lesser spotted woodpeckers tend to be far less conspicuous. Goldcrests and occasional firecrests are drawn to the areas of conifers, whilst buzzards are increasingly seen and heard soaring above the tree tops. In season, butterflies, dragonflies and damselflies haunt the woodlands, heathlands and wetter places; whilst late in the year, sea trout spawn in the streams, contributing to plentiful supplies of food for breeding season kingfishers. Extravagantly shaped autumnal fungi are also often abundant, whilst fallow deer and roe deer can regularly be seen.